When I first moved to the Northwest, I was bowled over by the charismatic-megafauna types of birds that lived in, soared over, and surrounded my city. Bald eagles soaring overhead--and even perching on telephone poles across the street! Ducks from all stops along the migratory flyway diving and dabbling in the lake just down the road! Great blue herons fishing just 30 feet away on the beach! After this first feathery onslaught, I came down to earth and started noticing the smaller "backyard birds." One of the smallest and most humble of these little birds turned out to be the most persistently charming: the tiny bushtit, Psaltriparus minimus. This little fellow appears to be a male, because the males have dark eyes and the females have cream-colored eyes. No, I do not know why. "Share and share alike" is the bushtits' motto. I never see them squabbling or shoving as they jostle for position on the feeder. If one flies away, all the rest are sure to follow. Even when the flock disperses for breeding season, each pair heading off to build its own nest, that cohesiveness endures: mated pairs often are assisted in the task of raising chicks by other, younger birds. It's cunningly woven from tiny twigs, dry grass, lichens, and moss, with snippets of what look like willow leaves, birch bark, and bits of excelsior, all bound together with spider silk--like something made by fairies. 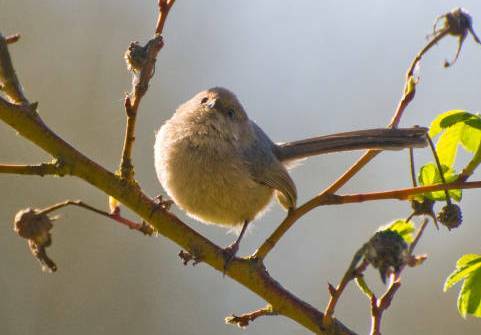 I was curious to find out what the bushtit's scientific name means and learned that it basically translates to "small harp-player" (Psaltriparus, from psaltria, Greek for "female harp-player," + parus, Latin for "titmouse," from Icelandic tittr, "anything small," + Anglo-Saxon mase, "small bird." Minimus, as you might guess, just means "smallest.") The "small" in the translation is obvious. The birds' calls are impossibly high-pitched twitters that sound completely un-harplike to me, but then again I would never have named the ring-necked duck for the faint ring around its neck when it conveniently displays a very bold white ring around its bill. Much better is the Spanish name for the bird, "sastrecillo," which means "a little tailor." I'm guessing this name refers to the bird's intricately woven nest.